Welcome to Trust Tuition Agency website. You have come to the right place if you are looking for better results and achievements for either your child or yourselves for home tuition. 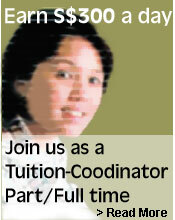 We are an expanding tuition agency specialized in providing home tuition in Singapore. With our decade of experiences, we have developed an effective system in the home tuition field. Here at Trust Tuition Agency, actual tuition rates may differ according to tutor's qualification, experience, subjects tutored, tuition frequency and special needs of the student.